Aww, so cute: those adorable photographs of Canada's Prime Minister, Justin Trudeau, posing last Monday with two giant panda cubs born at the Toronto Zoo. The photo was everywhere. Less often seen was a photo of Kathleen Wynne, the Premier of Ontario, also cuddling Jia Panpan (which translates to "Canadian hope") and Jia Yueyue ("Canadian joy"). Cuteness counts. The cubs were born last October 13 to two adult pandas "on loan" (actually being rented for $1.5 million per year from China, for ten years, plus another $100,000 for the cubs, with transfer to the Calgary Zoo scheduled for 2018). But, even their chubby charms have failed to bring in enough money to cover costs, let alone earn profit for the zoo. Attendance is down. However, I have another concern. Kathleen Wynne's government is involved with another species of bear: our very own native black bear. Her government has, sadly, returned to the spring bear hunt and expanded it across the province. The hunt is designed to attract hunters, especially American and European, to spend money in Ontario. 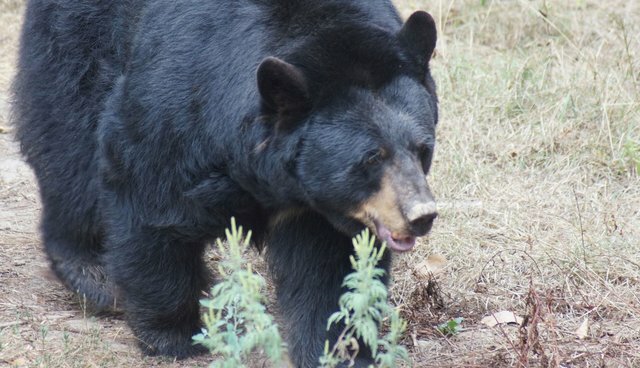 Hunters hunker in blinds or tree stands near bait that is spread on the ground to attract the bears as they emerge from hibernation, ravenous for food. "A fed bear is a dead bear," as we are told by wildlife managers across the continent-and the science points to the fact that one of the best ways to avoid human/bear conflicts is to avoid "attractants" that allow the bears to associate humans with food. And yet, that is exactly what Wynne's government is promoting. Hunters are not supposed to shoot female bears with cubs, but the problem is that mother bears tend to send their cubs into hiding before approaching bait. As Wynne's own scientists have pointed out in their research (but are kept from stating in the public forum), a certain percentage of mother bears are unintentionally orphaned and will die of starvation, thirst, exposure, or predation. Most Ontarians are decent types who don't like the idea of baby bears dying slowly in the name of profit. So, the idea is being sold that, somehow, shooting bears in the bush will reduce conflicts with humans. But, most bears never bother humans. Most humans don't hurt other people, either, and yet, I seem to read about a murder or two in the province almost daily. Surely, randomly killing a percentage of the human population in the assumption that it will get rid of the bad guys makes no sense-but that's the sort of thinking that seems to be driving the spring bear hunt. Really, it is about money, and votes, and-regarding pandas-international relations. Wynne and Trudeau both see China as a colossal market for our raw materials and natural resources. I wonder if Wynne would care more about cute and cuddly home-grown baby bears if we painted them black and white?